As most pundits were expecting, AMD has finally announced when it’s new batch of graphics cards based on their new Vega technology will be hitting shelves. It will be this August 2017, with three different video card models being released as part of the Vega launch. These include the RX Vega 64, a card which AMD claims is competitive with the GTX 1080 Ti. There will be both an air-cooled and water-cooled version of the RX Vega 64, the latter being a more powerful variant of the card. There’s also the RX Vega 56 card, which taking into account its $399 US dollars price will be going toe to toe with Nvidia’s GTX 1070. 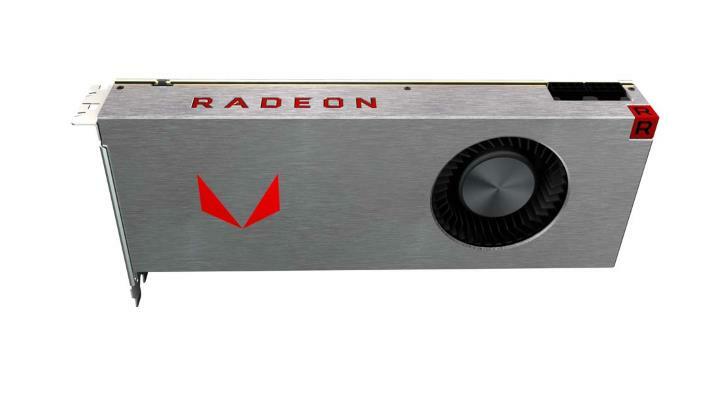 The RX Vega 64 meanwhile, will be priced at $499 for the air-cooled version according to GameSpot. It’s hard not to think that AMD is still behind Nvidia when it comes to video card releases looking at this Vega line-up though, even if the US company seems to have finally caught up with Intel in the processor market with Ryzen this year. But ever since it bought graphics card maker ATI in 2006, AMD has been playing a catch-up game with Nvidia in the graphics market, never actually managing to get ahead of the company run by Jensen Huang when it came to delivering great graphics cards. This has been due to a number of reasons. One is that AMD’s driver support has never been on the same league as Nvidia’s, which has provided stable driver releases for its GeForce graphics card for yonks now. AMD’s drivers have never been quite as solid, and their stability issues and occasional graphics glitches have put off many users from getting cards with AMDs GPUs. The RX Vega 64 specs do look good on paper, but will this card be good enough to worry AMD’s arch-rival Nvidia? And things would have to change quite a bit with the new Vega cards to lure away the Nvidia faithful, that’s for sure. Another thing that’s likely on user’s minds when looking at the new Vega line-up is these cards’ TDP (Thermal Design Power) numbers. 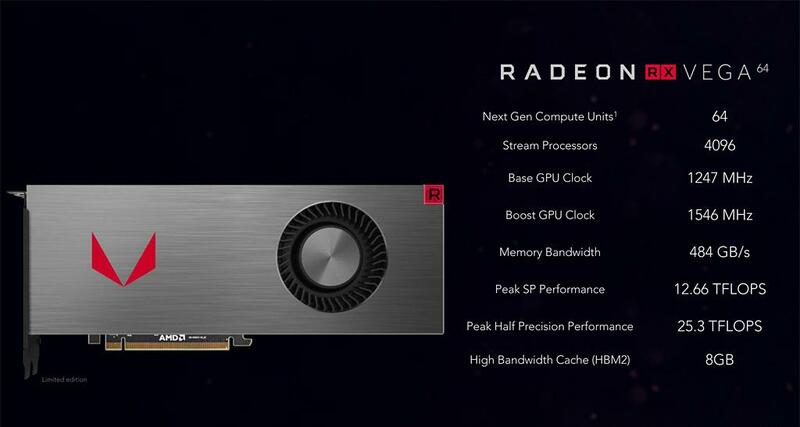 As a matter of fact, the RX Vega 64 liquid-cooled variant does not appear to be particularly energy efficient with a TDP of 350 W, meaning you’ll need a more powerful power supply in order to run this AMD card (by contrast, Nvidia’s flagship card, the GTX 1080 Ti, has a TDP of 250 W). And regarding AMD’s cards there’s always the issue of size, as these tend to be bulkier than Nvidia’s by quite a bit, while the cards in AMD’s line-up have always been quite a bit noisier than Nvidia’s too. Something else that could make the new Vega cards less attractive to buyers is their price. The RX Vega 64 air-cooled version will retail for $499 US dollars, which is not such a great price taking into account that this is only $50 cheaper than Nvidia’s GTX 1080 Ti, a card that will likely perform better overall, while still consuming less power. Plus, AMD’s cards have often suffered from the infamous “micro-stuttering”, which sometimes led to an inconsistent frame rate in games. But still, AMD fans will certainly be looking to the new Vega cards, which nonetheless offer a jump in performance with respect to the earlier AMD cards (which were based on the Polaris chipset). 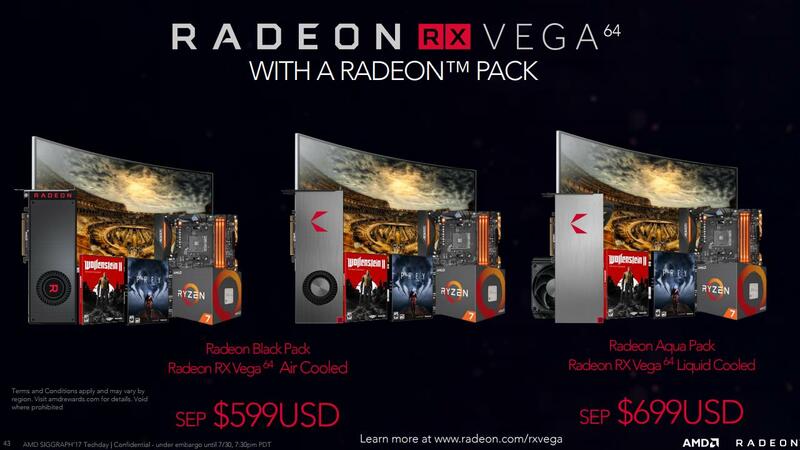 Plus, AMD is also offering bundles (see image above) of its new Vega cards together with its new Ryzen processors, meaning this could still be an attractive offer for those looking to upgrade their PC this summer.